There’s been something of a stylistic revival of hard-edge ’60s architecture lately, something that’s plain to see on the streets of Berlin. Local examples of the new-look brutalism/smoothism would include Scarchitekten’s Passivhaus Engeldamm and Dresdener Str. 31/32 by the developers Archigon (architects unknown). Both are basically stripey post-Stimmann era condo/lifestyle boxes for today’s fashion-conscious city dweller. Such works stand in some kind of opposition to the even more derivative condo option that is so recognizable these days, the neo-historicist, pseudo-old-world/other-world lifestyle block such as Palais KolleBelle and co…stuff that’s already been addressed on these pages in the sternest, most sardonic terms. In any event, you know that a design era is in a state of revival as soon as the source material that is its lifeblood starts to be destroyed. At the same time as it’s fashionable to crank out austere, eco-freindly machines for living, it’s all the rage to raze perfectly good glass and steel megastructures that are merely in need of a reliable asbestos abatement contractor. The classic example was the old Palast der Republik, the destruction of which was, of course, a travesty to the city planning/tourism boosting process. We all know about that, I assume, and what’s done is done, save the construction of the new Stadtpalast, which I swear will cause me to bail on Berlin if and when it ever gets built. But now another example of the crystalline ’60s is about to be summarily executed, also for the sake of preposterous neo-historical drivel. Standing blindfolded and smoking its last cigarette is the 1968 Konsistorium located at Bachstr. 1-2, by Georg Heinrichs and Hans-Christian Müller. Once it’s dead and buried the plan is to put up a courtyard house by one of Hans Stimmann’s minions from his glory days in the ’90s, Tobias Nöfer. There are seemingly no images of the new design available online, but of course it has to be called something predictably historicist and low-brow in equal measure: “Hansahof”. The name itself indicates what is at the heart of the backlash against both the old building’s destruction and the new building’s construction, which is that to build a traditional courtyard-style block in the Hansaviertel is in fact a desecration of the “urban fabric” -actually more a like an ex-urban constellation of functionalist objects floating in a sea of grass and trees- that has defined the area since the heady days of Interbau 1957. So the proponents of Modernist design are playing the same card as the New Urbanists did back in ’80s and ’90s, which is to advocate something that came before because (1) they like it and (2) it came before. And fair play to them for doing so. But, in truth, there are practical alternatives to just using architecture up and throwing it away. The question on all the radical architects’ lips at the moment is why it’s not possible to do something productive with a structure such as this. An obvious example would be to adapt the building’s interior, as well as its sheathing, to suit the intended brief of the new project, which is for low-income housing, and then put in some perma-culture urban farming plots all around it, and on the roof, where the residents could grow food to supplement what they can buy with their meager Hartz-4 takings. It could, like, change everything! Just brain storming here, but whatever…it’s not the kind of thing that anyone involved in the new project’s construction has probably ever done, much less considered weighing up such alternatives against what they’re planning to do and then performing a cost benefit analysis. But no one ever said that stopping the juggernaut of mindless German conservatism was going to be easy. That’s all there is to say about, really. Though the old Konsistorium looks beautiful as a post-apocalyptic ruin, it seems, in truth, to exist in a pre-apocalyptic state as regarding big “A” Architecture. 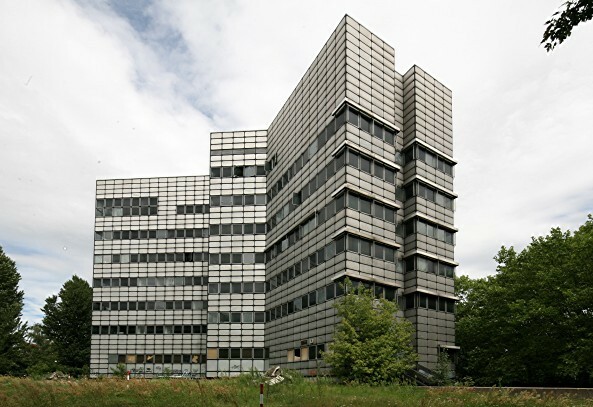 There is a quixotic absurdity in trying to salvage a ’60s office building that’s stood empty beside a trafficy intersection for the last ten years, but why not? Maybe we can all get together and change the situation the same way as we did with the petition to save Hejduk’s tower in Kreutzberg. 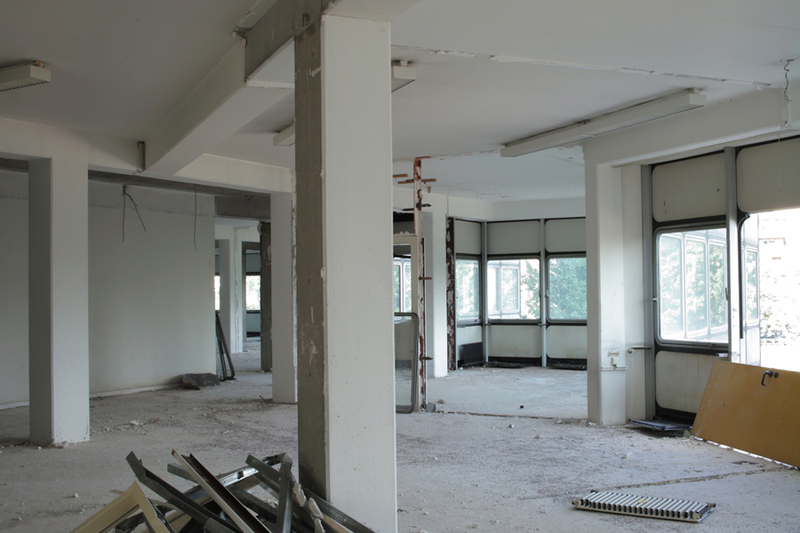 Last, a shot of the building’s interior that was passed on to me by the kind folks at Büro für Konstruktivismus. Just imagine the potential…I mean, I totally want to live in there!! !